Earlier this year I had the honour and privilege of interviewing, by phone, crime writing living legend Phyllis Dorothy "PD" James, Baroness James of Holland Park, OBE, FRSA, FRSL, in the lead-up to her 90th birthday on 3 August. I must confess to a few nerves prior to picking up the phone (which is very unlike me - and I've interviewed a range of people, from All Blacks and former Prime Ministers, to Super Bowl winning former NFL stars, to the Attorney-General, to authors who've sold tens of millions of novels), but Baroness James was an absolute delight to interview - polite yet opinionated, open and honest, incredibly intelligent, not afraid to talk about all sorts of issues, and absolutely 'as sharp as a tack'. During our interview we briefly discussed her somewhat famous interview, as guest editor of the Today programme on Radio 4, with with BBC director general Mark Thompson in December last year. Where this 'old granny' completely skewered the head of British public television. Now news has come through that Baroness James has in fact won the BBC’s Nick Clarke Award for journalism for her interview with Thompson. Reportedly, the Judges praised her for her "polite tone, sharpness and competence". The award is given in memory of Nick Clarke, former presenter of The World at One, who died in 2006. Baroness James was reported as saying, "The broadcast interview is one of the most effective ways in which the major issues of today’s world can be discussed, and I am greatly honoured to be the recipient of this important prize established in memory of a distinguished broadcaster". You can access the broadcasts from the day Baroness James was guest editor here. 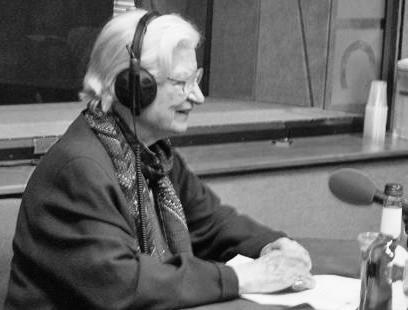 You can read the 9mm part of my interview with PD James here. I think we need a few more people like her. Fantastic! Go, the old gals. Great interview. P.D. James is a legend.